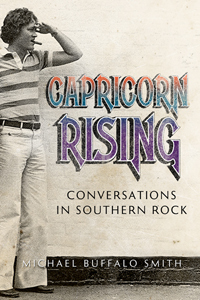 CAPRICORN RISING: CONVERSATIONS IN SOUTHERN ROCK is a collection of interviews with many of the stars, producers, and associates of the 1970s Southern record label, Capricorn, which was founded in the heart of Macon, Georgia in 1969. Author Michael Buffalo Smith has been interviewing the movers and shakers in rock and country music for over twenty-five years, and with this volume, he collects word for word, complete interviews with Capricorn artists including Gregg Allman, Dickey Betts, George McCorkle, Bonnie Bramlett, Paul Hornsby, Johnny Sandlin, Chuck Leavell, and many others, providing a glimpse into the early 70s when Southern Rock was born in Macon. CAPRICORN RISING also includes memorials to the two men who founded the Capricorn studio and record label, Phil Walden and Frank Fenter. The foreword is by Willie Perkins, The Allman Brothers Band tour manager from 1970–1976. If anybody has been the scribe for the history and growth of the music known as Southern Rock, it's been Michael Buffalo Smith. His devoted and in depth writing has for decades kept the public abreast of the music, the players, the triumphs, and the tragedies. Smith’s new book, gets to the heart of the matter with one-on-one conversations with the artists who have made this music part of American culture. In CAPRICORN RISING, Michael Buffalo Smith has put together a collection of personal interviews that take the reader through one of the most important periods in the long, wonderful history of Southern music. His care for and love of the genre and the musicians who added to it are present in each and every question. We should all thank him for his patience and ability to document the history—by presenting it from the inside view of those who were right in the middle of it all! I’ve known Michael Buffalo Smith for several decades and have the upmost respect for him and his talents. In this book of interviews with various musicians, artists, and folks in the music business from the South, he brings forth great insight into the making and development of the Southern Rock sound. You get all sides of the story and the history unfolds as he leads the interview subjects with dexterity and great questions. This is a highly entertaining, interesting, and important read! Michael Buffalo Smith has a deep passion and knowledge of Southern music and Capricorn Records, the label most singularly associated for bringing the Southern Rock genre to the world. His journalistic chops go beyond the superficial writing that often skims the surface of Southern Rock by sharing the real story. CAPRICORN RISING is an on point oral history of Southern Rock where Smith interviews those who helped create the genre by always asking the right questions. If you are a serious student of Southern Rock, CAPRICORN RISING is a must read.